Agbakoba, a Senior Advocate of Nigeria(SAN) who made this observation at a news conference in Lagos, said it had been made clear that the government would rather run a lean but effective administration. ``The agenda of Buhari’s government was well defined by Vice-President, Yemi Osinbajo at the Nigerian Bar Association (NBA) conference that ministries and departments are likely to shrink. ``So, I don't think that the suggestion for a maritime ministry is feasible. ``The government is underpinned by being lean and efficient, therefore, suggestions that there might be new ministries is unlikely. ``Rather, you will find that ministries, departments and agencies will shrink. ``What might happen is, in fact, bringing together all the multi- modal transportation agencies under one umbrella, and I don't think it matters anyway,’’ the human rights activist said. He stressed that he was in support of the idea that a lean government would impact on the economy since about 80 per cent of the nation’s resources was spent on recurrent expenses. Agbakoba added that this needed to be balanced such that more money was spent on capital and human resources than recurrent. He said that government only needed to create an enabling environment, right partnerships with the private sector and ensure that the cabotage regime was enforced. The maritime lawyer added that the enforcement of the cabotage would benefit the private sector through the Cabotage Trade Act. He said that this could be handled by a very strong department in the ministry of transport. On his evaluation of the Buhari administration’s first 100 days, Agbakoba said this evaluation should be done in the right context. He urged Nigerians to understand that the change they voted for through Buhari would be in the minds of the people and not in the context of new projects. He stressed that it may also not be new buildings or the commissioning of new roads and power plants, as he expressed satisfaction that more Nigerians had become positive towards the anti-corruption crusade, aligning more with doing things properly. 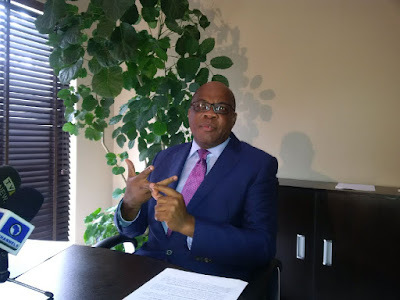 Agbakoba also called for a decentralized federalism where all the powers would not be concentrated at the centre, but have the states to be more useful in handling a lot of issues concerning the states. To this end, the former President of the NBA, stressed the need to expunge the federal character provision in the constitution, with a belief that it would make the people more efficient in their duties.